Nothing says celebrating the United States of America quite like grilling up some juicy burgers, cracking open some crispy cold ones, and watching a bunch of stuff invented in China blow up in the air. And if it’s in the Mile High air? Even better. 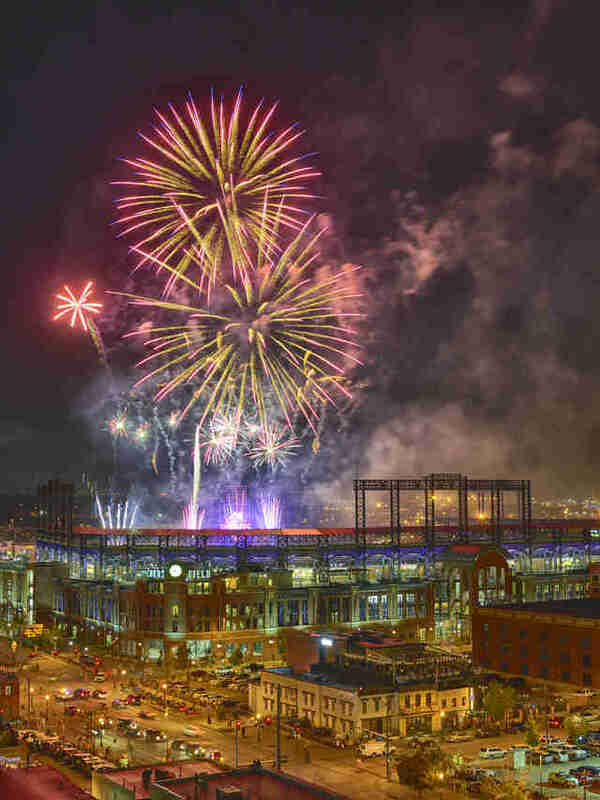 This year, Denver plays host to slew of opportunities to watch Fourth of July fireworks sparkle and boom. And we're giving you the rundown on all of 'em. Choose wisely, this day only comes around once a year. The Rockies are having an up-and-down season but no matter: The Fireworks Games, as they’ve come to be known, are always a hot ticket. This year’s events are made all the more exciting with division rivals, the San Francisco Giants, in town. Seats are still available (starting at $27) and here’s a tip: Try to get one in left field or the Rockpile, because before the fireworks start -- about 20 minutes after the game -- you’ll be invited to watch them from the outfield grass. If the baseball game strikes you as an inconvenience in advance of the main affair, then skip it. 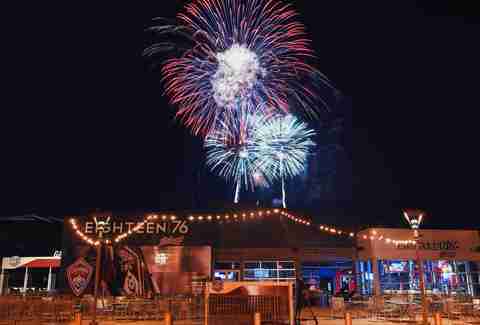 Take in the Coors fireworks from one of the best rooftop patios in Denver at Avanti, where the collective eatery plans to stay open until 1am to keep the party raging deep into the night. Billed as “Independence Eve 2018,” this display takes advantage of the fact that a lot of folks might want to party hard on the 3rd, having the 4th, itself, off work. This year’s Downtown celebration comes correct with a concert, light display, food trucks, and two beer and wine gardens. The concession areas open at 4pm and arriving early is encouraged. The big draw near the Flatirons is hosted by none other than the University of Colorado’s mascot. Ralphie’s Independence Day Blast features a bunch of bands, free admission, and probably some vegan food because this is Boulder, after all. Blues Traveler plays the Fourth of July at Red Rocks for what seems like the 84th year in a row. And while John Popper & Co won’t usher in any kind of fireworks display at Red Rocks itself, this show has long been known as a destination to catch tons of displays across the Front Range, from high atop the venue’s perch. The Colorado Symphony plays the expansive, grass-lined venue in the southern ‘burbs backed by a massive fireworks display. The event plays up its “family-friendly” nature, so feel free to have the youngsters in tow. So, you know, if you’re in the market for a super-boozy 4th, maybe pick another spot from this list (of which there are many). Tickets run $22 - $37. Two concerts -- Super Diamond on the 3rd and Firefall on the 4th -- begin the respective evening’s activities. The picturesque facility will host a fireworks display after the shows end. What’s more American than a rollercoaster? A bunch of fried food you say?! Well say no more. This Fourth, you can get your fill of all that Elitch’s has to offer -- including the theme park and water park -- before the complex closes down for the night. That’s when you’re invited to stay later to watch a bunch of explosions. USA! USA! 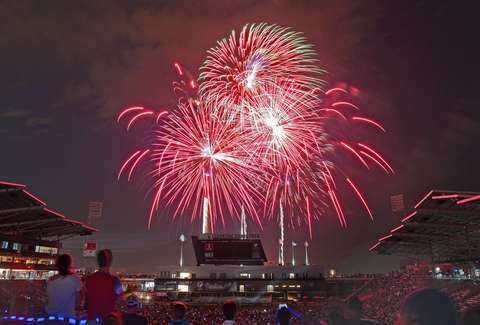 Not to be outdone by seemingly every sports team/stadium in town, the Colorado Rapids and Commerce City are planning its own patriotic party: the 23rd annual Fourth Fest. First, there’s a festival and concert outside of the stadium, and then the squad takes on the Seattle Sounders. Finally, the sky is lit with what the organizers are calling “largest public fireworks display in the state.” We’re not exactly sure how they’re measuring that, but it should be pretty damn impressive. If seeing a 2018 rendition of Hook isn’t your cup of tea, the Fort provides another excellent option for viewing all manner of fireworks from the foothills. It also provides, as always, an excellent opportunity for consuming bull testicles, aka Rocky Mountain Oysters. Specials for the evening are buffalo ribs and a firing of the Fort’s famous cannon. Props to Glendale for seeing that everybody else was throwing its fireworks bashes on the 3rd and the 4th, and one-upping the lot of ‘em. 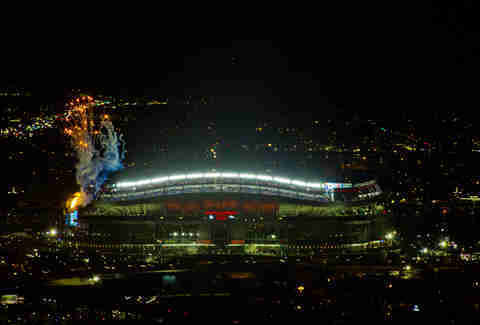 That’s right: the town-within-a-city (think the Vatican but with strip clubs and a Target) is shooting the pyrotechnics on July freaking 2nd. And Four Mile will have food trucks and a beer garden to take it all in. Colin St. John is a Denver-based writer.